Here’s a photo I snapped when I took a bunch of pictures at Historic Jacob Hill Inn, a beautiful bed & breakfast inn where we stayed during a recent trip to Seekonk, MA. 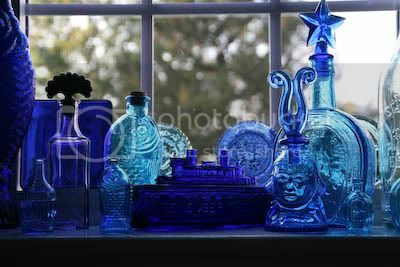 I walked down one of the stairways in the inn’s main house and found this batch of glass bottles displayed on a window sill there. Pretty! I love those blues! This is a lovely image, and my very favorite shade of blue. Nicely done. Beautiful. I love blue glass too. what a beautiful vignette. I wish I had the eye to do something like this in my own home. The inn's owner had several vignettes like this on the stairway landing sills. They caught my eye because they were so well done. I took another photo of one in green, but the blue bottles were my best shot. I love this photo. I am also a great lover of coloured glass... always have been. When I lived in Mexico I had some coloured bottles on my window sills and one of my very favourite things was watching our cat Meelo moving carefully between the bottles. That is a gorgeous photo! Don't you just love the way glass looks in the sunlight. Beautiful work! And the blue... gorgeous! I love blue everything, glass, ceramics, sea, sky. Nice photo. Great picture - thanks for posting! And also for the tip on Jacob's Hill Inn. It looks great - just as an inn should be. I'm so glad you left a comment at my blog and decided to come to yours to return the favor, and what a beautiful picture greets me! I love blue glass (and all kinds of blue and white porcelain). Very lovely photos on your posts - I'll be a frequent guest!